Winning the Animation award in 2009 gave me an opportunity to go on a placement year at Ubisoft Reflections. Apart from the obvious learning aspects, I really enjoyed the diversity of students coming from all over the UK and internationally too. What I like most about Teesside is that it is not just a university, you come here for lots of things not just studying. I am a volunteer at the English café and I enjoy sitting and talking to other people with different cultures and different backgrounds. Everyone here is friendly, it’s really nice here. 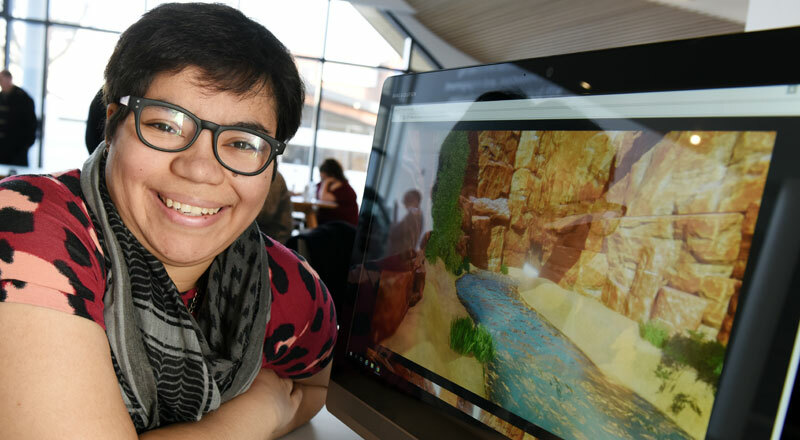 Teesside University helped me get closer to my goals – from aspiring to work in the games industry to securing my first job. There were many reasons that I wanted to come to Teesside. I believe that you only get out of life what you put in. Give it your all and Teesside University is somewhere you can excel. My time at University gave me the confidence and skills to achieve the goals I wanted from my choice in career. It was an amazing few years where I met some wonderful people. Everything I did lead me to where I am now. The final major project was my favourite. I made my first film and learnt a lot! The education I received was really beneficial and has given me a very professional attitude towards my work. It’s not all performing – there’s essay writing and modules on radio acting and TV presenting, and we get behind the camera and learn to use the editing suite. Studying at Teesside has been one of the best learning experiences I’ve had so far and I’d definitely recommend it to anyone thinking about studying there. The expertise of the staff covered a huge variety of genres. If you have your mind set on something in the course, it can help you strengthen your skills in that area, and even better, make you gain new ones you might not have realised you had.